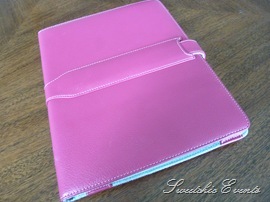 M-Edge iPad Jacket Review — Sweetchic Events, Inc. I drive all over the city and suburbs for various appointments, and sometimes opt to arrive early to avoid horrendous Chicago traffic. I hate lugging around my 6 lb laptop/cord/mouse/mousepad, so the iPad is the perfect solution! Not to mention the 3G service (which I have yet to try). And most importantly, on Wedding days, I can finally do away with my clipboard of 70+ sheets of paper including checklists, timelines, floorplans, seating arrangements, contact info sheets, vendor contracts, etc., etc. Of course, I had to find the perfect case for it. I have major butterfingers, so I can’t just carry this baby around, all loosey-goosey. After spending 2 days researching my options, I decided on the M-Edge Executive Jacket in Pebbled Fuchsia which I ordered from Amazon for $49.99 + free shipping, versus $59.99 from the M-edge site. POCKETS. This was a feature I had to have, so this ruled out 80% of the iPad cases out there, most of which are pocket-free. The closure tab is super long and can be annoying to insert (ok, sorry that sounds dirty…). It also flaps around, but it’s fine for me to just fold it over and tuck it under the iPad. I wish it had a short magnetic snap. I need to fashion some sort of strap for this jacket. I tend to put down my clipboard a lot during a wedding day and I’m terrified of leaving my new friend behind for some lucky person… I’m thinking of finding a purse strap that I can slip though the 2 elastic straps in the middle. As for the iPad…? I’m still working on figuring it out! Unfortunately, the wifi connection is spotty, which is weird because my laptop’s wifi is absolutely fine. So browsing the internet, setting up my email, setting up iTunes, downloading apps, etc., has not been as easy and seamless as I was hoping it would be (and as everyone SAID it would be!!). Considering that this is my very first Apple product ever, apparently there is a learning curve. What about you? Do you have an iPad? Did you research a lot of cases, or did you buy the basic Apple case?